I’ve tried different carnita-like dishes including the Taco Bell Cantina Tacos, the Del Taco carnitas, carnitas from a local pub and even had the pleasure of enjoying some very authentic carnitas prepared in an actual Mexican restaurant (me and my friend were the only non-Latinas there). I used to not enjoy corn tortillas very much and thusly, I didn’t really care for the carnitas I had tried at Del Taco – but luckily I was lucky enough to try those more authentic well-prepared ones which really got me into the whole cilantro, lime and corn tortilla combo. And also, corn tortillas supposedly don’t have gluten so it really helps me reduce the amount of gluten my body has to deal with. I was happy to see that my boyfriend had brought back everything that I had asked for in order to prepare these carnitas. 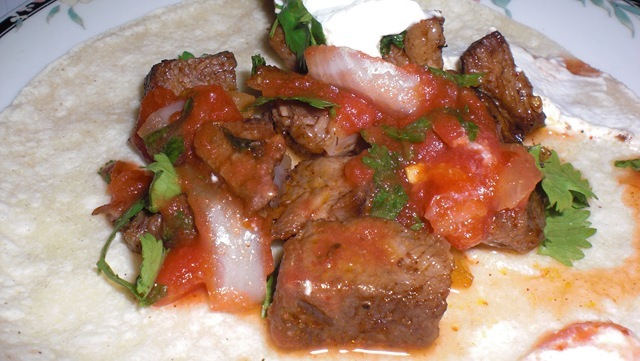 The picture of my carnita is very sloppy – this was because I had already eaten two carnitas by the time I found the camera and by then I was tired, full, had very little chicken left, and didn’t bother chopping the cilantro much. If you’re going to barbecue it, you really don’t have to do much to the meat in my opinion other than rub it a bit with chili pepper, lime juice and mix it in with chopped garlic. If you’re going to prepare the chicken in the kitchen, feel free to add whatever seasoning you enjoy. I like to use ginger powder and when I’m really in a hurry, onion and garlic powder. Toast a few corn tortillas. I don’t use two like you usually see because that makes it to heavy in my opinion but if you like to use two for one carnita that’s pretty much the norm. Cut the meat into small chunks and mix it in with freshly chopped cilantro, diced onions, a few squeezes of lime, and a dash of salt. Place it on the tortilla. You can also add chili powder and whatever else you would like to add. You can also add the raw onions and cilantro after adding the chicken and then go ahead and squeeze the lime on top of that. I usually do that instead because it’s faster. I like to add extra condiments like shredded cheese or sour cream. I also added a bit of freshly prepared salsa (well, not really fresh since the tomatoes were canned!). Just chop up fresh cilantro along with raw onions, add to either a can of diced tomatoes or dice four fresh ones, add some lime juice and whatever seasonings you like depending on how spicy you like it. I added a bit of onion, garlic and ginger powder as well as chili powder and crushed pepper – and a secret dash of that hot sauce with the rooster on it (yes, I know what people call it). I was making coleslaw and still had a half a cabbage head left so I thought I would make a hot dish with it. I had already made Korean cuisine-inspired pork cabbage wraps, so I wanted to make something different, in this case, a soupy faux-curry dish. It didn’t exactly start out as a curry-ish dish, but instead I wanted to make a basic cabbage and beef stew. I was going to make dumplings with it, but instead I ended up toasting up a flour tortilla and eating some of it with some cream cheese, and fire sauce from Taco Bell. It reminded me a bit of a dish an Indian woman had prepared me and the tortilla is actually an acceptable substitute for naan bread when you just can’t get a hold of any or don’t feel like baking your own. I had a few servings of the stew this way, then I put it in the fridge to eat the next day. Since I didn’t want to eat the same thing again, I decided to turn it into a pseudo curry, which actually works quite well especially because the cabbage at this point had become almost part of the soup. Note: If you want to reduce the calories from fat, you can allow this dish to cool in the pot, let the meat fat solidify and scoop it up with a spoon. Or you can render the fat from the meat beforehand by frying it up in a pan and draining it (you can save the fat for other dishes). You may also eat this dish with dumplings or rice. A pound of ground beef (or whatever protein you would like). 1 onion and 2 cloves of garlic. Herbs, spices, curry mix (I like to try different herb combinations, in this case I used thyme, rosemary, chili and a curry powder mix). Half a head of cabbage. A tablespoon of vinegar (caper vinegar can be used). Slice the cabbage into strips and chop the onions and garlic. Add to a slow cooker (or pot) with the ground beef. Add enough water to cover 3/4 of the contents in the pot. Add the curry mix (and whatever other herbs you want) to taste. Add the vinegar and slow cook for at least two hours. The longer it cooks the softer the ingredients become — it depends on your texture preference. Dish out, top with sour cream or yogurt, garnish with chives, capers or even roasted nuts. Tip: This dish also works well with with a toasted flour tortilla, or if you have it, naan bread. If you are going to use a tortilla, the best kind for a soupy dish like this is a tortilla that is a bit chewy like Guerrero. I like to toast them up where they’re a bit crunchy and puffed up. Note: I may not post as many reviews/recipes this week because I’m working on two animation projects, though hopefully will be finished by Tuesday. Thanks to everyone who has been keeping up with my blog. I hit 100 views in one day yesterday which I didn’t expect, so thank you to The Impulsive Buy for linking me on one of their pages! I’ve recently really been craving pizza, and since I really don’t have the cash to be ordering pizza I have been finding other ways of getting my fill. I’ve been preparing a lot of burrito/taco dishes lately and am usually left with a good amount of left over taco meat so I decided to use the left overs to prepare a basic taco pizza. Also, we purchased a heck of a lot of bread the last time we went shopping and I had to use our last loaf of French bread before it became moldy and inedible. These two recipes are so easy and quick that you’ll be enjoying a delicious pizza in no time! Taco pizza sans extra toppings. 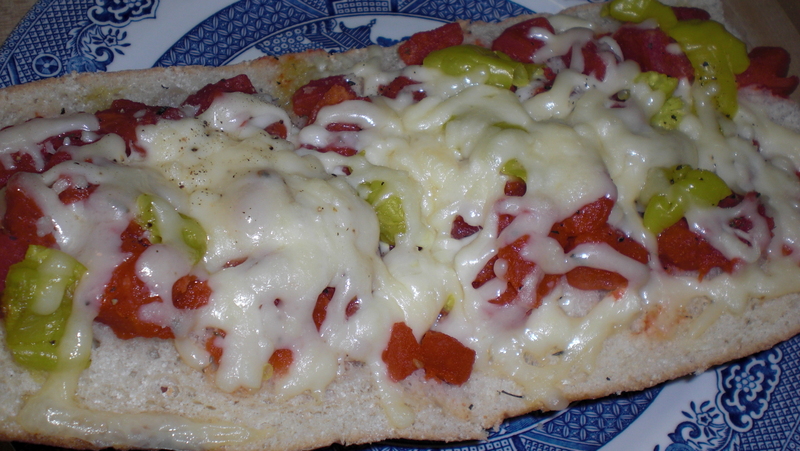 A frozen cheese pizza (I found that the Great Value frozen pizzas, or even the Wal-Mart fresh ones work well). Ground beef (half a pound should do). Chili, garlic, salt, and onion powder (or a packet of your favorite Mexican powder flavoring mix). Your favorite hot sauce (Cholula or even Taco Bell’s fire sauce work great). Shredded lettuce, sliced black olives, and any other condiments you may want to add. If you’re going to add onions and garlic, chop them up. Place ground beef in a heated pan with a very thin layer of oil. Fry up the meat while stirring until most of the fat has melted, then drain it (you can save the grease to make a base for soups or sauces if you wish, but use it within the next day or so or it will start to smell weird). Add the seasoning and mix well. 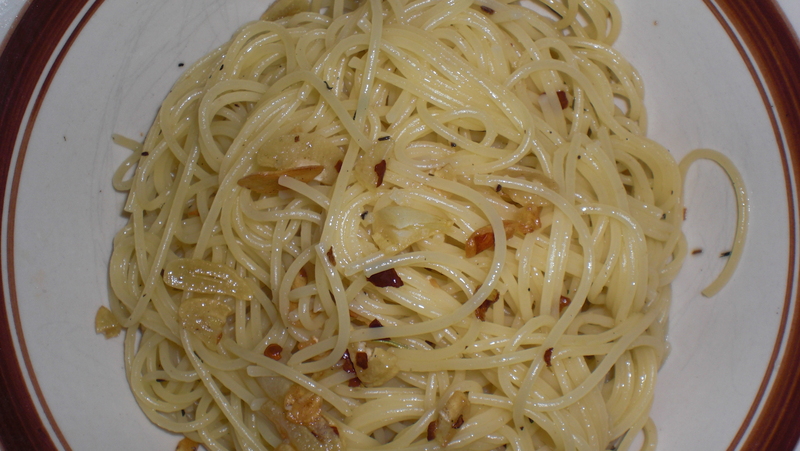 Cook until the onions have become clear and the garlic has become a bit softer. 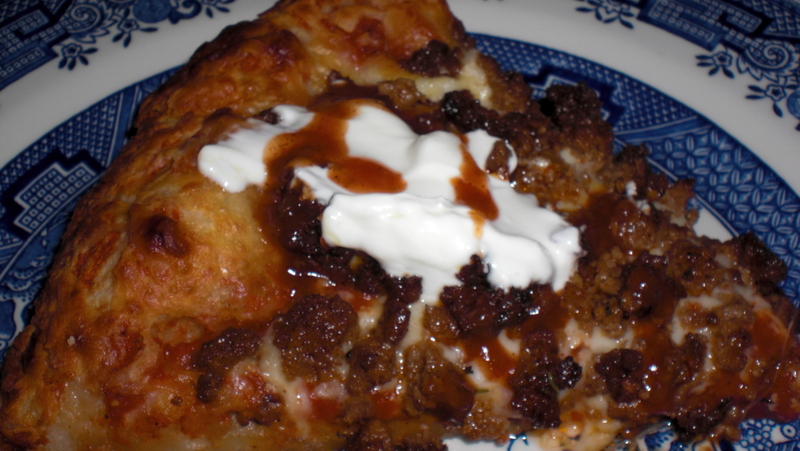 Place your frozen pizza on a sheet of aluminum foil (you may want to use some Pam on the foil depending on the pizza). Spread the taco meat evenly. Place the pizza in a preheated oven according to the box’s instructions. Usually the time mentioned on the box is enough to cook the pizza thoroughly even with this topping, but you can always leave the pizza in a bit longer as long as the crust isn’t turning too dark. 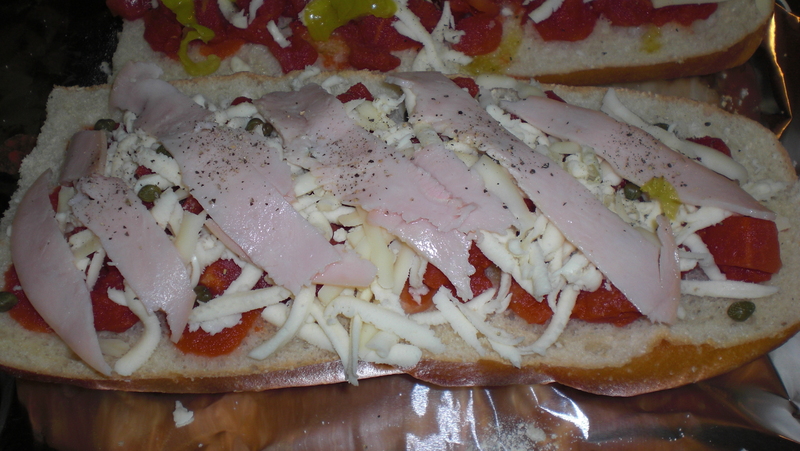 If you think it needs more time, you can always place aluminum foil on top of the pizza to avoid further burning. 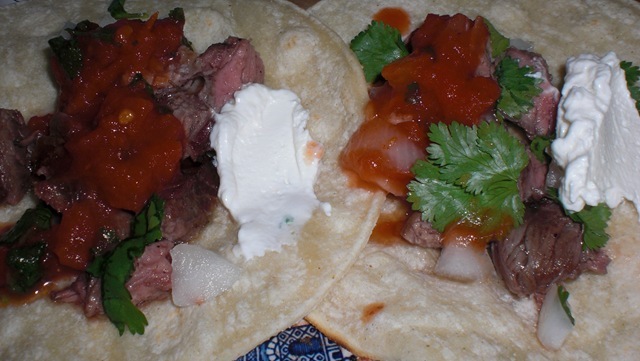 Add dollops of sour cream and whatever other taco toppings you want. 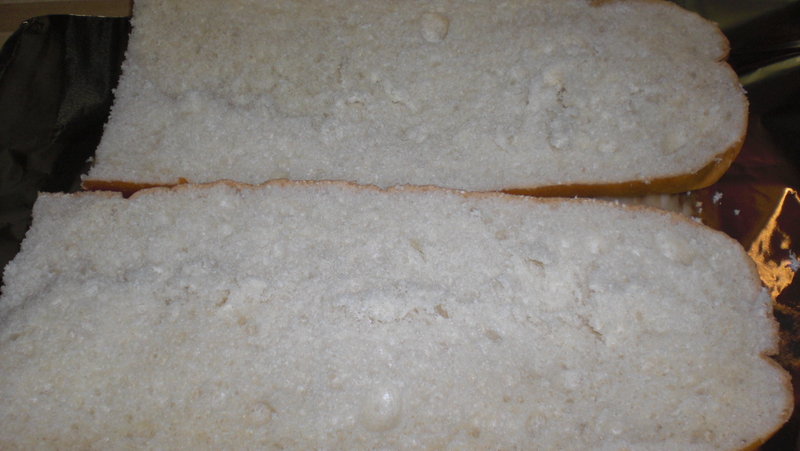 French bread sliced in half. A loaf of french bread. Either canned tomato sauce, or diced tomatoes, or even fresh tomatoes. Olive oil, garlic salt, onion powder, and favorite herbs such as basil and thyme. Slice the loaf of bread in half length-wise. Add the tomatoes. It’s up to you how much. Lightly douse it with olive oil and sprinkle the seasoning. Sprinkle the cheese on top (as thickly as you like just beware that the more toppings you have the longer it will take for them to cook). 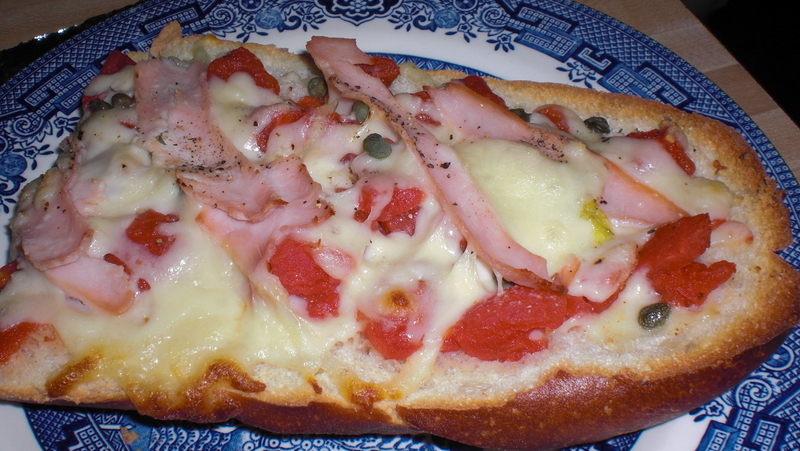 Add whatever toppings you like, such as capers, ham, pineapple, grilled chicken or beef. Place in the oven at about 350 degrees. Let it bake for about 15 minutes. The best way to avoid burning it is to keep an eye on it, or if you really don’t trust yourself, you can place aluminum foil on top after about 5 minutes into baking to prevent the bread from burning. After baking (turkey, capers, not covered with aluminum foil when baked). 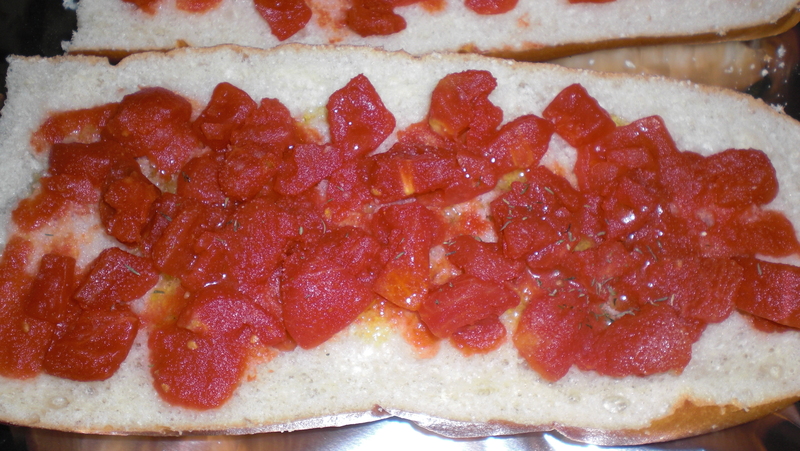 After baking (pepperoncini, covered with aluminum when baked). I initially wanted to make a tomato sauce dish with the lamb chop I recently bought, but instead decided I would experiment a bit and try something different. I have been wanting to prepare a Stroganoff dish in a while so I decided I might as well make it with lamb since I had the basic ingredients needed for the sauce. And considering I had just purchased three artichokes the day before I decided to cook those as well and enjoy one or two as a side-dish. This isn’t the prettiest dish but I really enjoyed the end result. The sauce tastes a bit like sauerkraut and compliments the richness of the lamb quite well. One thing I would be careful of is the fact that once you top your lamb chop with the sauce, it is a bit hard to see where the bones are underneath. I don’t bother trimming or slicing my artichokes in half when I cook them because I’ve eaten them this way all of my life and it takes no preparation. You may dip the artichoke in mayo, butter, or a mixture of olive oil, vinegar and salt. There are several other dips you can make as well such as mustard sauces. Tip: You can cook all of your artichokes at once and just refrigerate what’s left over. Artichokes are just as good cold as they are hot, in fact, they’re also quite delicious uncooked! One or two lamb chops (depending on their size). One onion and a few cloves of garlic. Some sort of fat, such as butter, or meat drippings (you can also collect the lamb drippings and use those). 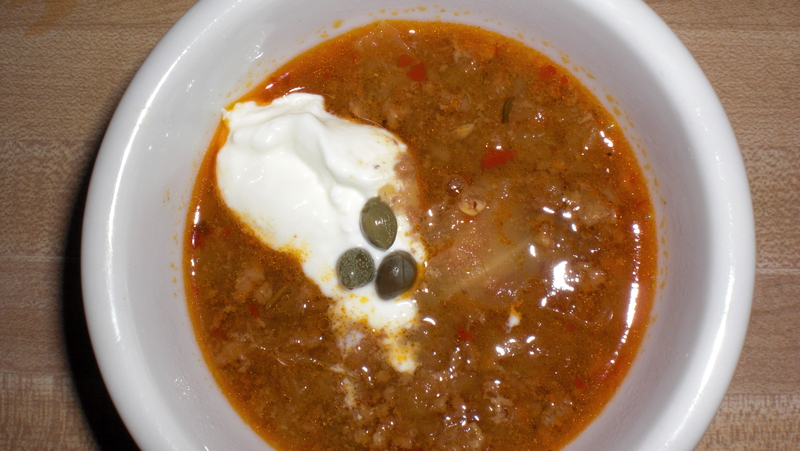 Sour cream (about 5 teaspoons). Mustard (one and a half teaspoons). Horseradish (about half a teaspoon or more depending on your tastes). 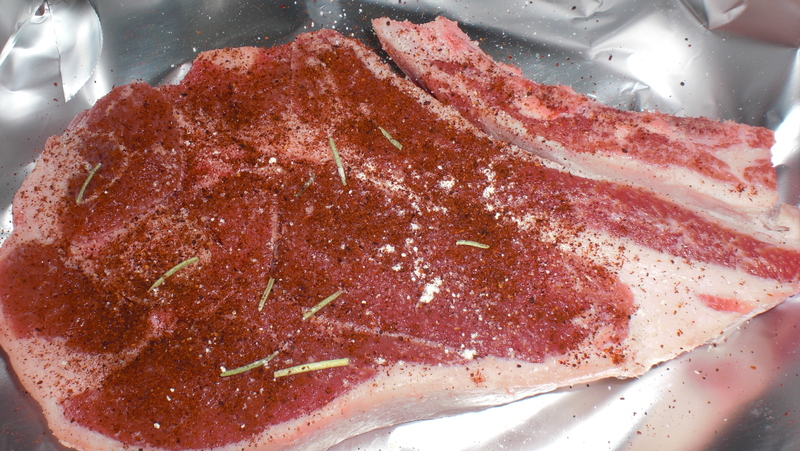 Salt, chili or paprika powder and rosemary to taste. Rub the lamb chop with the herbs and spices. Sprinkle some salt on top as well. 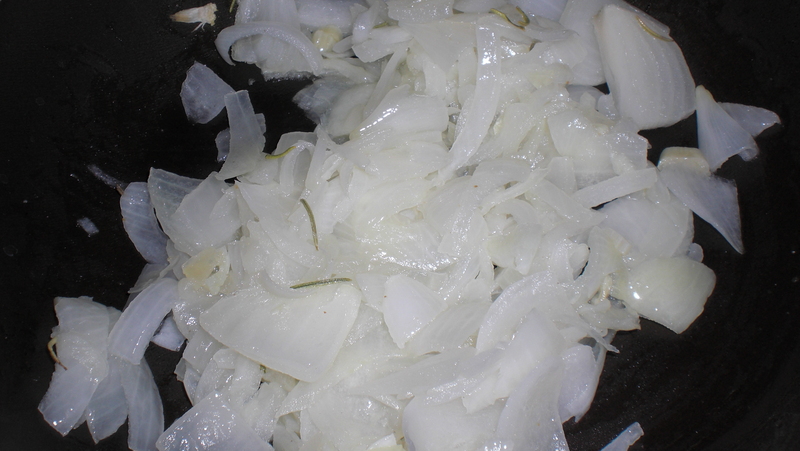 Chop the onion and garlic and place in a pan with a thin layer of olive oil. Place the lamb chop either in the oven (you can cook the an artichoke wrapped in aluminum foil at the same time) or cook it in a pan. I like my lamb to be cooked medium with a crust on both sides. I cooked mine at 400 degrees and just kept checking it to see when it was cooked the way I like it. Fry up the onions and garlic on medium heat until they turn transparent and then add about two teaspoons of butter (or meat drippings). Let the onions and garlic caramelize. Once the onions have shrunk and have turned a light brown, add the sour cream, mustard and horseradish. 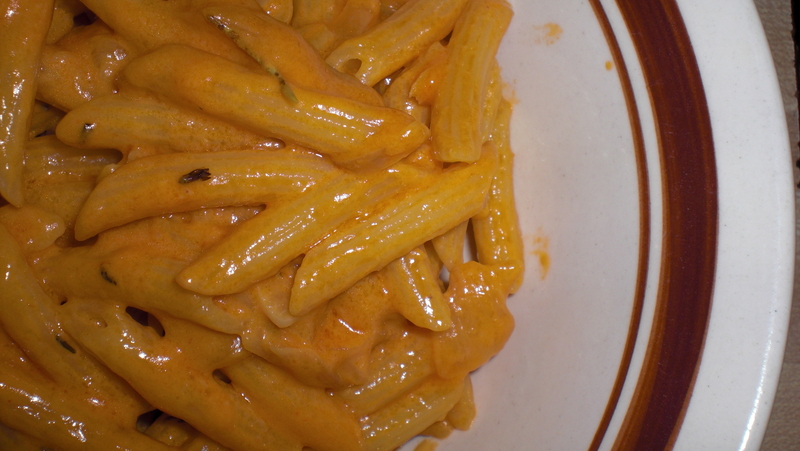 Mix well and allow to simmer on medium-low until the sauce is hot. Once the lamb chop is ready, place it in a place, then place some of the onion Stroganoff sauce on top. 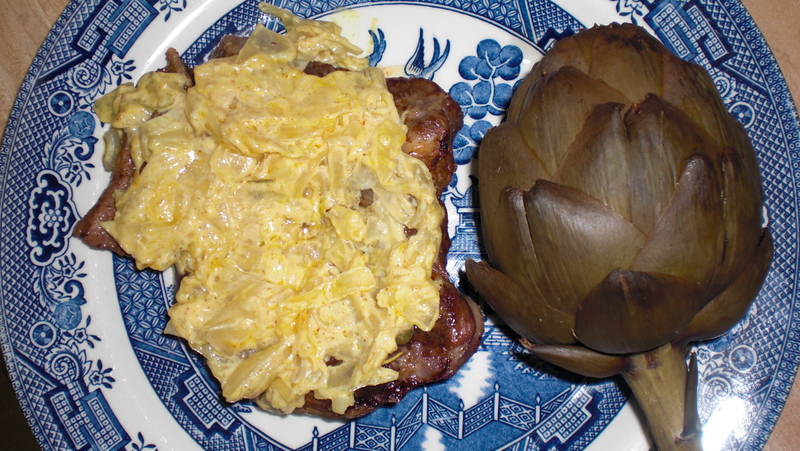 Enjoy with the side of artichoke! 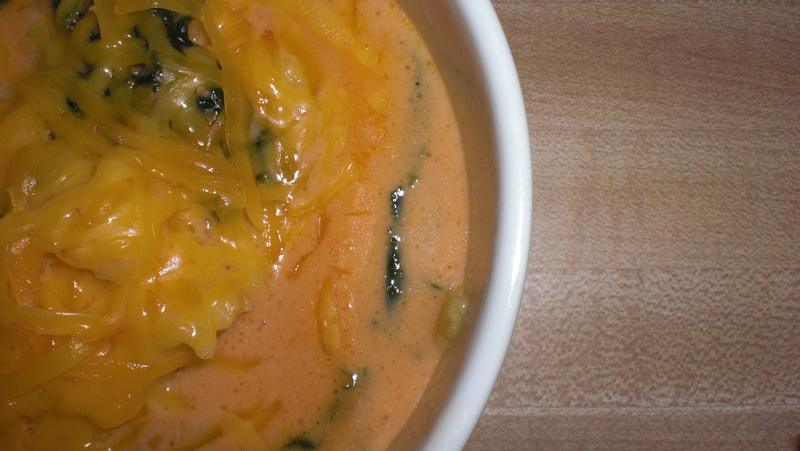 Close up of the soup. 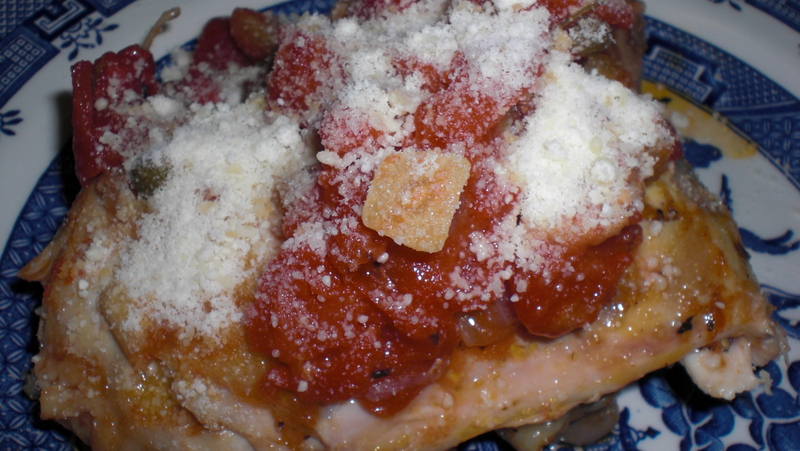 I know, another polenta dish, and really, I had grown tired of eating polenta. But you see, we ran out of food and only had a few things left in the kitchen, so I decided to try and cook something up and see if I could make anything that was edible. So I decided to take whatever I had in the fridge and cupboard to see what would come out. I was actually amazed that I had enough ingredients to make something I actually wanted seconds of. The only problem is, this stuff is way too filling for me! About 3/4 of a cup of some kind of fatty meat drippings such as ground beef or lamb. Polenta (find out how to prepare). Dribble a bit of olive oil into a pot and turn up the heat to medium-low. Place the onions and garlic in the pot and allow the onion to turn a bit transparent while browning the garlic. Add thyme, rosemary and salt to taste. Add the fatty drippings into the pot and turn it down to low. Let it simmer for 15 minutes while stirring occasionally. Cook further if the onions need more time to caramelize. They should be turning brown and shrinking a bit (you may shorten the cooking time if needed but it won’t be as flavorful). Add about 2 cups of v8 to the pot together with 1 cup of cream. You can add more cream if you like it to be creamier, but it will make it heavier also. Mix two teaspoons of corn starch into a cup with cold water and make sure to work the lumps out. Slowly add the corn starch mixture into the pot while stirring to avoid creating lumps. Keep stirring for 8 more minutes to allow the corn starch to thicken. Scoop up some polenta and place it into the middle of the bowl. 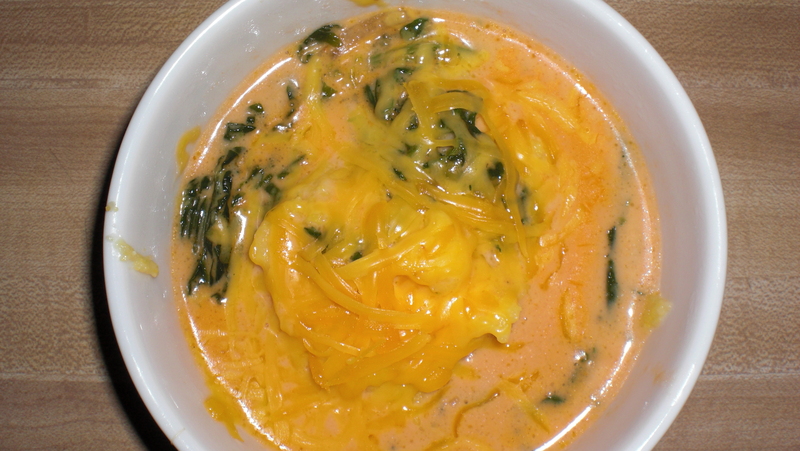 Pour as much soup as you like on top of the polenta and place the cheese of your choice on top of that. Tip: If you want to try slow cooking the soup over several hours on low, or even in a slow cooker, you will get a deeper and more blended flavor. You can always add meat to the dish if you would like. Instead of adding the drippings, you could use half a pound of 15% fat ground beef. Top view of the soup.